The Bellewood Drive job is a perfect example of creating a gorgeous outdoor space. This pool is designed for friends and family to gather and enjoy each others company. This homeowner really grasped the concept of creating a backyard and outdoor living oasis. 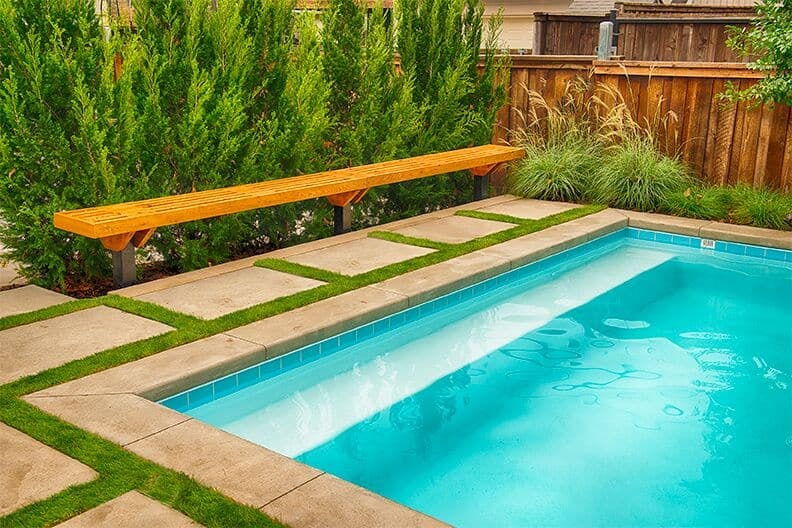 We always talk about the importance of designing your pool around the natural layout of your backyard; this pool is no exception. The Bellewood Drive job is a beautiful project that truly maximized its backyard space. We created a large pool with enough deck room for cooking and entertainment. So, how did we design such a unique space and make it look so glamorous? Let’s dive in! This pool is absolutely gorgeous. We can’t say it enough so we had to share some more brilliant pictures. Notice how the scenery is designed to be elevated to give the impression of a taller backyard. This is well balanced by the Umbrellas located along the left hand side of the deck (top image). Are we working on a pool remodel? Or is this going to be a new pool? Are we constructing any additional structures, such as a Pergola, Outdoor Kitchen, Landscape Lighting, or Decking? We use the power of Pool Studio to bring all of our drawings to life. We always advise customers on one thing and its what we are renowned for. We design completely custom backyards that are catered towards your layout, lifestyle and desired functionality. This is where the rubber meets the road and where we have the most fun working with our homeowners. Our design services are completely free and available for any stage of backyard improvement. We generate Pool Studio renderings, send you the YouTube link and provide you with a quick turnaround on the renderings. This is a great way to communicate and one that our customers love! This is a great photo of the Bellewood Job taken in the evening. It show cases the beauty of the deep blue plaster complimented by the LED Lighting along the left hand wall of the pool. Because this job is so gorgeous, we want to brag about a few details. The details are critical to every job; that’s where we differentiate ourselves from the competition. With that said, we love to share our work what makes each job so special and unique to us. Starting with the pool decking, we created square concrete pads out of poured concrete. We spaced these pads exactly the same distance apart and parallel to each other to create the proper look. This is a European style of decking that is popular in high-end pools across much of France and Italy. We enjoy the beautiful look it creates and thinks that it really boosts the elegance of the decking for this pool. The pool plaster is a deep blue finish which is complemented by the standard-sized LED Pool Lights that are shown along the left wall (in the top image). 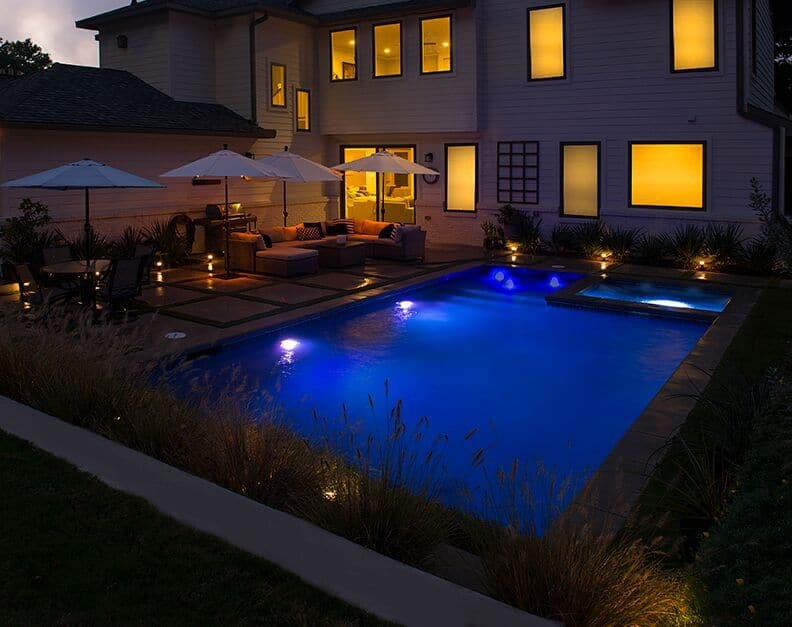 These lights are capable of transforming into any color or light show desired by using the Screen Logic Bundle Application from Pentair Pool Systems. This is a brilliant technological innovation that allows you to control your swimming pool from the palm of your hand, i.e: your iPhone or Android device. We also added LED Bubblers to the Splash Pad for this pool to create a synchronized color scheme. These bubblers will stay in sync with the LED Pool Lights to create a brilliant lighting display that is sure to wow your family and guests. The attached Spa is perfect for staying warm is frigid temperatures and is sure to provide a serene view of the gorgeous landscaping that wraps around the pool. These square deck pads were constructed of poured concrete. These are tricky and require each pad to be spaced exactly parallel in order to create the proper look that we were going for. We have so much fun creating amazing backyards and know that we are living our life’s purpose. Because of this, we are so excited that you are here and invite you to contact us for a free design consultation. You will be amazed by our award-winning service and professionalism throughout the entire design and construction process.